Acquired in 1999, MV Dronning Ingrid underwent conversion from a Danish rail ferry into the world’s largest non-governmental hospital ship. Sponsored by corporate and individual donors, the purpose-built Africa Mercy has five operating rooms and an 82-bed ward. Africa Mercy’s hospital covers most of the original rail deck – approximately 1,200 square metres. It is divided into 5 wards with quadrants containing supply/services, five operating theatres, recovery/intensive care and low-dependency wards with 80 patient beds. Projected annual medical capacity is approximately 7,000 surgical procedures onboard including cataract removal /lens implants, tumour removal, cleft lip and palate reconstruction, orthopaedics and obstetric fistula repair. The hospital is well-equipped and contains a CT Scanner as well as X-ray, laboratory services and a Nikon Coolscope, which allow remote diagnosis almost instantaneously. Whenever required, diagnoses are transmitted via an onboard satellite communication system to doctors in developed countries. In addition to the operations performed onboard, ship-based teams work in local villages providing a wide array of services to increase health and well-being which include dental clinics, medical clinics, community health education, HIV/AIDS intervention, water and sanitation projects including well drilling, construction, agriculture and micro-enterprise projects. Africa Mercy has meeting and work spaces as well as berths for an average crew of 450. The 474 berths are split between 26 family cabins, 25 two-berth cabins for couples, and shared and single cabins for individual occupants. The vessel is fitted with an automatic sprinkler system throughout the accommodation and hospital areas. An addressable smoke detector system pinpoints the exact location of the source of any potential fire. Machinery spaces are covered by CO2 gas flooding system as well as a “Hi Fog” system which can be very effective in controlling localised fires in the machinery space. Gurkha security guards man the gangway 24 hours a day with metal detectors and other screening devices. They are backed up by CCTV around the vessel, while critical spaces such as the bridge and engine room remain locked at all times. Africa Mercy sails under the flag of Malta and is maintained “in-class” with Lloyds Register as a passenger ship to international standards. Formerly a Norwegian ferry (Polarlys), the Caribbean Mercy was acquired by Mercy Ships in 1994. In her 12-year history, the Caribbean Mercy contributed more than 20% of Mercy Ships’ total output in terms of number of services, value and beneficiaries, serving primarily in Central America and the Caribbean basin. While in port, she hosted an average crew of 120 volunteers from more than 20 nations. The Caribbean Mercy was outfitted with an eye surgery unit, cargo capacity and accommodation for up to 150 people while in port, as well as conference and seminar facilities used for a variety of programmes. Her fuel and water tanks provided a cruising range of 12 days, or 3,600 miles. Crew on board the Caribbean Mercy offered close to 289,000 services, at a value of over £56 million and with 348,800 people as direct beneficiaries. Performed more than 7,000 surgeries such as cataract removal, strabismus, dental and orthopaedic procedures. Delivered more than £1.1 million of medical equipment, hospital supplies and medicines. Completed more than 140 construction and agriculture projects including schools, clinics, orphanages and water wells. The Caribbean Mercy visited 137 total ports in her 12-year history, and conducted 56 field assignments in 13 nations: Dominican Republic, Haiti, Nicaragua, Guatemala, El Salvador, Russia, Korea, China, Philippines, Colombia, Puerto Rico, Honduras and Belize. 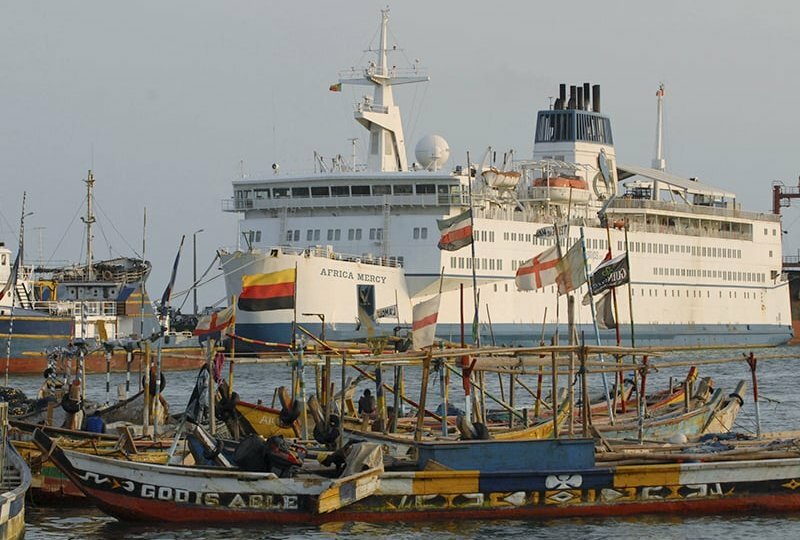 Formerly a Norwegian ferry (Polarlys), the Caribbean Mercy was acquired by Mercy Ships in 1994.